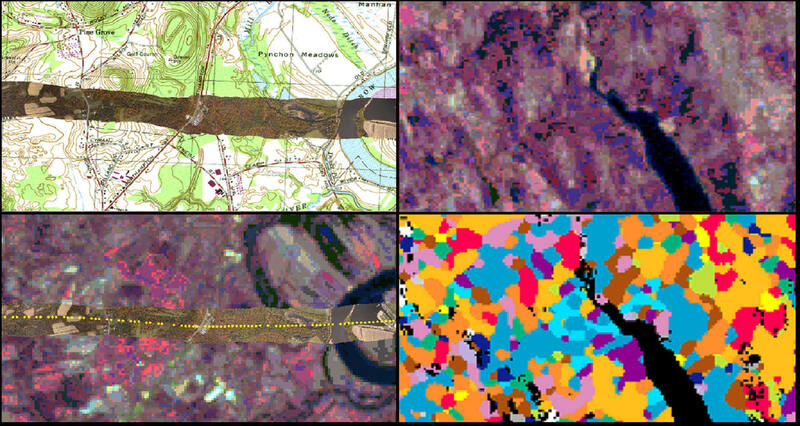 Our multi-scale 3D approach uses a combination of heuristic photointerpretation and spectral classification to map the landscape from the individual tree level to regional vegetation communities and land utilization. Fly large-scale transects that identify individual trees, plants or crops. Work with local experts to build a visual key of critical species using selected images from the transects. Classify transects as a geographically distributed sample of species and plant communities across differing topography. Use the transect samples to drive the classification of smaller scale coverage or multispectral satellite imagery. Mapping vegetation from imagery is complicated by the unique intricacies of each ecosystem. A local expert may understand his region and identify every plant from the ground or small aircraft, but he rarely has the time, skills or inclination to undertake a computerized classification of the vegetation communities. Resource Mapping’s approach captures that local expert’s knowledge to drive its own multispectral classification of the region. We fly a low-altitude grid over the area (either in conjunction with higher altitude imagery or as the first step to mapping from satellite data) at a large enough scale for the expert to easily identify and mark individual trees and plants. We then work with the expert in Stereo Analyst to develop a visual key for the critical species as they appear in that specific set of images. This key is used to feature-map and classify large sections of the aerial transects, capturing examples of the different vegetation communities over the range of slope and aspect that will affect their spectral reflectance. When a large enough sample has been processed, the spectral mixture models that characterize each community can be determined and used to drive the regional classification.